After running the Soaring Wings Half Marathon Relay, which completed a streak of five straight weekends of having races, we took a weekend off in preparation for another race filled calendar for the month of November. 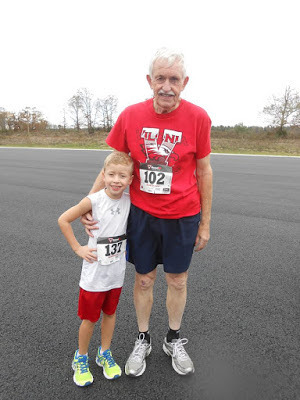 The first race on the docket was the Vilonia Veterans' Museum 5K. Braden and I ran this particular race last year, but this year, I wouldn't be able to run it because I had National Guard commitments. We run this race because it helps out the museum, they have a very nice ceremony afterwards, and because Linda Hicks, who is the race and museum director, has always been a supporter of the both of us. The original museum was destroyed in the tornado that hit Vilonia in 2013 and it was re-opened at its new location this year. The previous race course started at the high school and ended close to the original museum, but this year Linda wanted a different course. I felt honored when she asked if I could map out a new course and I wanted to make it where the course basically began and ended at the new museum location. My plan for the new route was to eliminate some issues from the past with timing, since it isn't a chip-timed race and keeping off of the main highway that runs through town. After experiencing a few challenges with trying to get a course laid out, I was able to get an out and back loop designed for the 3.1 mile event that took care of the issues from the past. Ever since Braden set a PR at the ARK 5K Classic in early September he has had trouble with the two subsequent 5K races he participated in. The ARK 5K was very humid, so I figured with the cooler weather Braden would be able to continue to set new PRs. 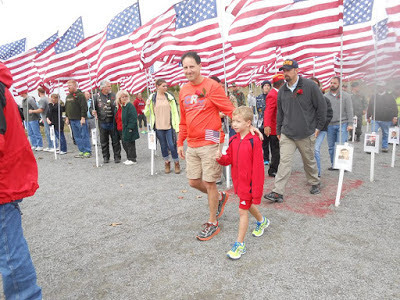 Even with perfect weather conditions and courses, Braden didn't do near as well as what he wanted to, but he did bounce back and put together some solid 10K runs leading up to the Veterans' Museum 5K. Bad weather hampered some of our preparation the week of the race, but we were able to get a good run in on the exact course a few days prior. The only worries I had was that I saw that the conditions would be a little difficult with 10-12 mph winds and he started to get a cough the day before. Needless to say, I wasn't expecting anything great and based off of past races where he had the coughing situation, he hasn't performed well. Luckily on the day of the race we had family day activities for my unit. Even though I had to be at the unit to lead and assist others in our Army Physical Fitness Test in the morning, after the test we were released to bring our families back for festivities in the afternoon. After pacing some of our Soldiers for the 2-mile run, we finished up at around 9:30 a.m. 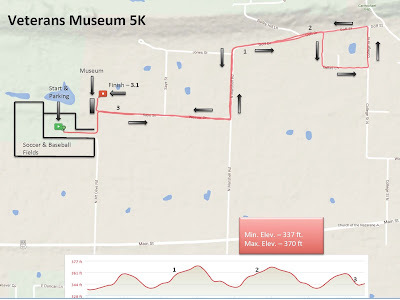 There are not too many races that start late in the morning, but the Veterans' Museum 5K started at 10 a.m. and I started to make a beeline to Vilonia hoping to maybe run a little of the course with Braden. After rushing home and quickly changing, I got to the museum, jumped out of my truck and started running the course where I knew I would most likely meet up with Braden as he was heading back. Prior to getting to the museum, I was hoping that maybe they had started late and once I headed on the course, I found out that it had started about 15 minutes late when my wife called me as I was passing the tail end of the walkers about a 1/2 mile into the race. Once I hit the one-mile mark of the course the race leader was passing on the other side of the road and not too far behind him came the second and third place runners. To my surprise, I looked in the distance and saw Braden coming towards me in fifth place! Once we met, I turned around to run the rest of the race with him and right off the bat I could tell that he was going at a very good pace. He told me that his watch messed up and he didn't know how fast he was going, but I told him that we were going pretty quick and that the rest of the course was going to be more downhill and the wind was going to be to his back. I asked him how he was feeling and he said he felt great other than going into the wind for the first part of the race. We tried to set a goal to catch the fourth place runner and going into the final turn, I let Braden turn it on and he almost caught him at the finish line. Before we got to the finish, one of our friends mentioned that he was going to finish below 25 minutes, which would be a new PR, but I didn't realize, until I met up with him, how good he really did. He finished with a time of 24:03 and knocked 1 minute and 6 seconds off his previous PR!! Because his Garmin messed up, I wasn't able to get any splits, but overall he finished with a 7:45 minute per mile pace and I figured that he most likely was going faster than the 7:45 pace his last mile. To get an idea on how much he has progressed; at the same race a year ago he finished with a time of 30:07 (a six minute difference!) and he has shaved off 2 1/2 minutes of time since the Spring Fling 5K seven months ago when he ran a 26:35. It's almost scary to think how much faster he will be this upcoming year. 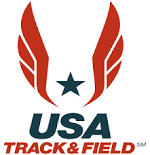 I know one thing...him running USATF track has really helped his speed and his coach and I have really noticed how much faster he has gotten over the past few months. After the race, Braden received two awards as the youngest participant and youngest runner (there were no age group awards). Since I'm in the military, I was honored to participate in the program after the race honoring our fallen military members and, like last year, Braden stood with me during the ceremony. Another one of the special things the event does is they give a picture and narrative of who the runner is racing for in their running packet. This is to certify that Braden Eason ran in the Museum of Veterans and Military History 5K held Nov. 7, 2015 in honor of Pvt. 1st Class Wallace Lee Reather, Jr. of Conway, Ark. A rifleman, he served in B Company, 3rd Recon Battalion, 3rd Marine Division, III Marine Amphibious Force, U.S. Marine Corps. He died Jan. 27, 1968 in Quang Tri Province, South Vietnam. Ground casualty from explosive device. I'm really glad that Braden had one of his best races to honor Pvt. 1st Class Reather! Our next race will be the Breakaway 10K in Searcy, AR, where Braden ran his very first 10K race. Last year it was very cold when it was in the low 20's, but the forecast is looking like it will be in the 40's this year, so Braden should have another good performance.